R script to complete for microarray analysis, check our microarray wiki page for a detailed description of the workflow. On this page you can find an introduction to R, the statistical programming language. We will assume that you're working in RStudio, although most of the things we show will also work in the R editor. Although you can work directly in the R editor, most people find it easier to use RStudio on top of R. RStudio is free separate software to make R more user-friendly. It's essentially a graphical user interface for R.
Check out this video tutorial on the RStudio user interface. Find and replace can be opened using Ctrl+F. RStudio supports the automatic completion of words using the Tab key. For example, if you have an object named relfreq (relative frequencies) in your workspace, you can type r and then Tab and RStudio will automatically show a list of possibilities to complete the full name of the object. R is available at the CRAN website. Upon choosing a CRAN mirror, you can download R.
R is available for Linux, Mac and Windows. You can download RStudio from the RStudio website. Check out this video tutorial on installing packages in R.
Part of the reason that R is so popular is the enormous diversity of packages that are available for R. Packages are collections of R programs that are able to perform a certain analysis, e.g. Matrix is a package that contains all the R-code you need for creating and working with matrices. R packages are available at the CRAN and Bioconductor websites. How to install packages in R ? 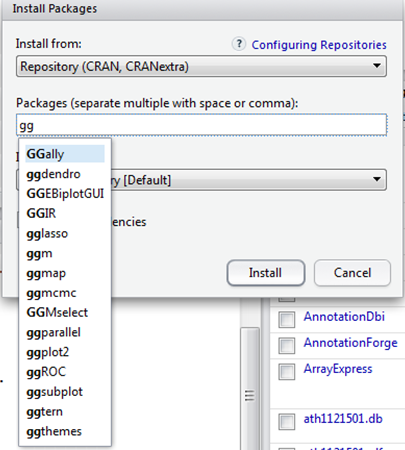 Select the package you want to install – in this case ggplot2 - and click the Install button. In the console you can see if the installation was successful. An R project is a folder in RStudio where all your work on one project (e.g. a chapter in your PhD dissertation) is gathered. Projects help you to stay organized. When you create a project R will load data and scripts from and save results to this folder. Select New Project from the Project dropdown menu in the top right corner. 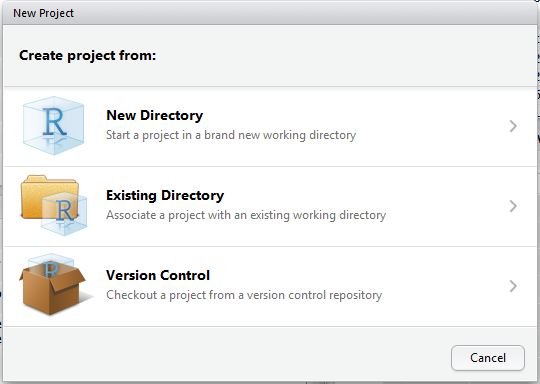 Next you have to specify if the project should reside in a new or in an existing directory on your computer. A script is a text file that contains all the commands you will use. You cannot only write and run scripts but you can also save them so next time you need to do a similar analysis you can change and re-run the script with minimal effort. An R project can contain multiple scripts. How to create a new script in RStudio ? You only need to install a package once. But each time you want to use a package you have to load it (activate its functions). How to load packages in R ? Unfortunately this section is nor easily accessible nor well-structured and it can be quite a challenge to consult the help files of different R packages and functions online. By far the most user-friendly interface for searching the R documentation is the Rdocumentation website. How to show the documentation of a package ? How to show the documentation of specific topics ? How to check which data type a variable belongs to ? A data frame contains several elements. It essentially has a matrix structure but some of the columns of the data frame might be matrices themselves. The different elements are allowed to contain different data types. How to list the elements of a data frame ? All columns in a matrix must have the same data type and length. How to list the names of the rows or columns of a matrix ? This page was last modified on 17 March 2019, at 20:27.